This year’s Triple-A All-Star game between the Pacific Coast League and the International League will be played in Reno, Nevada on July 17. 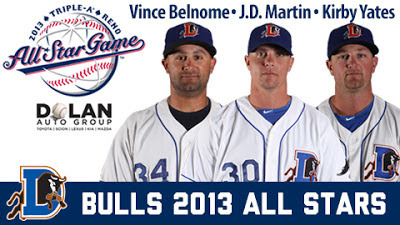 Three Durham Bulls will be there: Vince Belnome, J.D. Martin, and Kirby Yates. Congratulations to all three for their selection — and for their terrific performance as Durham Bulls this year. Have fun in Reno. Check out the link for a set of profiles. WDBB has little to add — we even stole the image!